It can be daunting as a mid-sized company when entering a new international market. Especially so when entering a region as diverse and fragmented as the Middle East. Although no matter where you go around the world, you can’t just copy and paste a strategy that has worked well elsewhere and expect it to succeed in a different market. With digital channels becoming more and more essential in today’s business landscape, here are some key aspects to consider for your digital strategy when entering a new region. You’d be surprised how many companies come to the Middle East and don’t create a region-specific website. Nothing will frustrate your customers more than if they can’t find simple information about you when they search online like basic product details, your location and contact information, opening hours etc. According to a recent Gartner report, only 15% of businesses in the region have an online presence. This is some very low hanging fruit, so make creating a local mobile-responsive website your first port of call when entering a new market. Don’t forget to include an Arabic language option for the content on your site too. Speaking of customers searching for you online, it’s important to realize how people’s search behaviour differs around the world, and that it is essential to treat each market separately when it comes to Search Engine Optimization (SEO). Conducting simple localized keyword searches around topics related to your product is a must, as well as doing so for the Arabic language also as the most highly-searched keywords can differ across languages. Don’t forget to include the local country in the meta tags of each of the web pages in the process, and make sure to create business listing pages on Google for your head office and retail locations. Make it as easy as possible for your customers to find out about you online. With almost 50% of the people living in the Middle East region being under the age of 30, it’s no surprise that social media is incredibly popular here as a form of expression and communication. In such a diverse region, visual channels such as Instagram and Snapchat have become especially popular in recent years as a way of propagating a common visual language. Similarly with video content. YouTube is the most used social platform for video consumption in the region and Saudi Arabia, with a staggering 90+ million active daily video views, has even surpassed the USA to become the #1 consumer of content on this platform. The Middle East as a region is built on respect for people and culture. Whilst most markets in the region have been adopting a more relaxed approach to social content, countries like Saudi Arabia have far stricter rules regarding the type of messages and imagery that can be leveraged. Despite, or maybe because of that fact, User-Generated Content (UGC) is an extremely popular form of content that brands here try to encourage. The Middle East also has its own community of super-influencers who use Instagram, Twitter, Snapchat and YouTube to collaborate with brands and communicate a more relatable, yet personal story. This could be a relevant approach to consider when entering a market in the region. While some regions around the world embraced online shopping more than 20 years ago, the Middle East has been somewhat slower to join in. Up until recently, most purchases made online would be paid for in cash on delivery as many customers remained skeptical of shopping online. This has changed over the last 5 years or so, with more and more businesses accepting online payments and customers finally feeling comfortable with handing over their credit card information to companies online. Amazon’s acquisition of Dubai-based Souq.com in 2017 was a boon for the region and signals a validation of the concept of eCommerce here in general. According to the Midddle East-based online payment platform PayFort, the e-commerce market here is set to double to more than $69bn by 2020 with the UAE accounting for $27 billion of that and the Kingdom of Saudi Arabia $22 billion, making them by far the two largest eCommerce markets in the Middle East. Food for thought when considering whether or not to facilitate online payments on your local website. In case all of the above didn’t convince you of the importance of a localized digital strategy in the Middle East, maybe these statistics will. Even though many people around the world might consider the Middle East to be somewhat of a traditional region, the population here is surprisingly tech-savvy. For a starters, Middle Easterners are a very well-connected bunch with more mobile connections here than there are people (128%), higher than in the Americas, Asia-Pacific and Africa. Smartphone penetration is exceptionally high here also, with the UAE having the highest smartphone penetration rate in the world at 80.6% according to Newzoo’s 2017 Global Mobile Market Report. Saudi Arabia is not far behind at 65.2%. 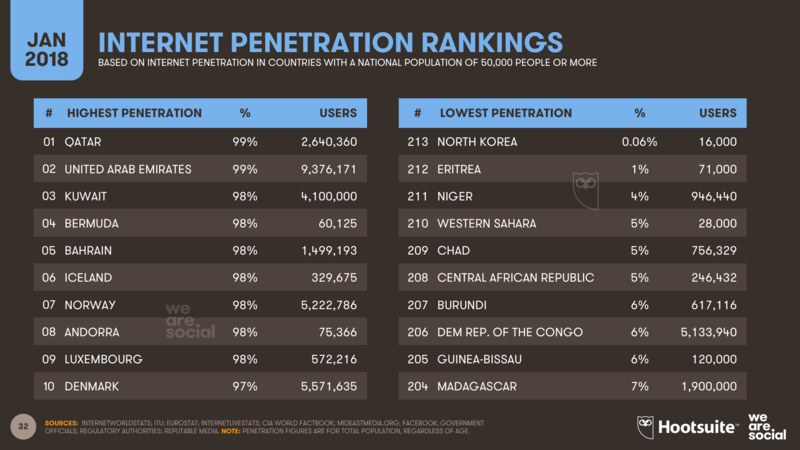 When it comes to internet penetration, UAE (99%), Qatar (99%) and Kuwait (98%) are the three highest ranked countries in the world according to the 2018 Hootsuite & We Are Social Global Digital Report. Mobile internet usage in particular is very high here too, with Saudi Arabia (64%) and UAE (61%) in the top 12 countries globally when it comes to using a smartphone as opposed to a computer to access the internet (StatCounter). While it might seem like a lot to take in, you should consider digital channels as an opportunity rather than a challenge to overcome when entering a new market like the Middle East. Understanding the region and how the people here use digital technology in their day-to-day lives can help you build up a loyal customer base and create a solid foundation for future success. Utilizing a local expert who knows the region can give you a head start so don’t hesitate to get in touch with us if you want to take the next step!